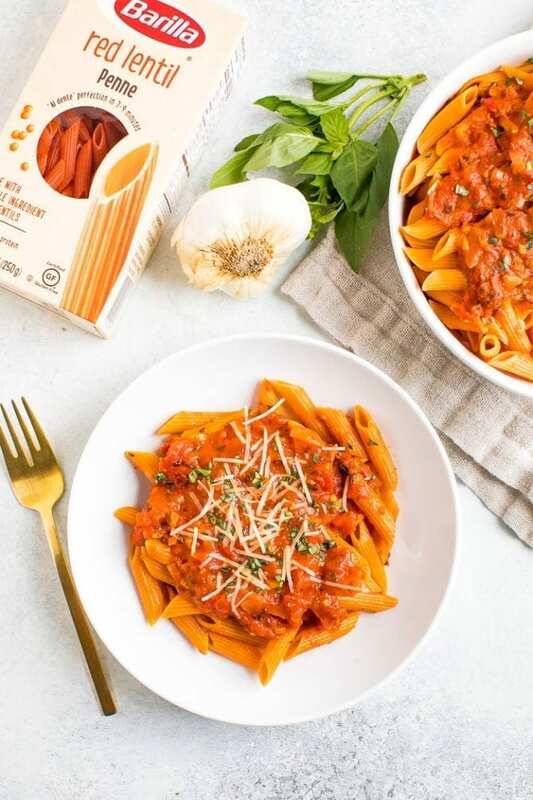 A lightened-up penne alla vodka recipe made with protein-packed red lentil penne and coconut cream. 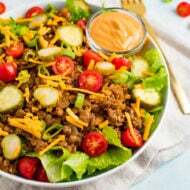 This version has less calories and fat, more protein and fiber and it’s still loaded with creamy flavor. Gluten-free and vegan. This post is sponsored by Barilla®. Can you believe Valentine’s Day is right around the corner? Whether you avoid it like the plague, celebrate Galentine’s Day instead or are looking forward to a date night with your sweetheart, I’ve got a recipe for you. Now I’m curious… which camp do you fall into? 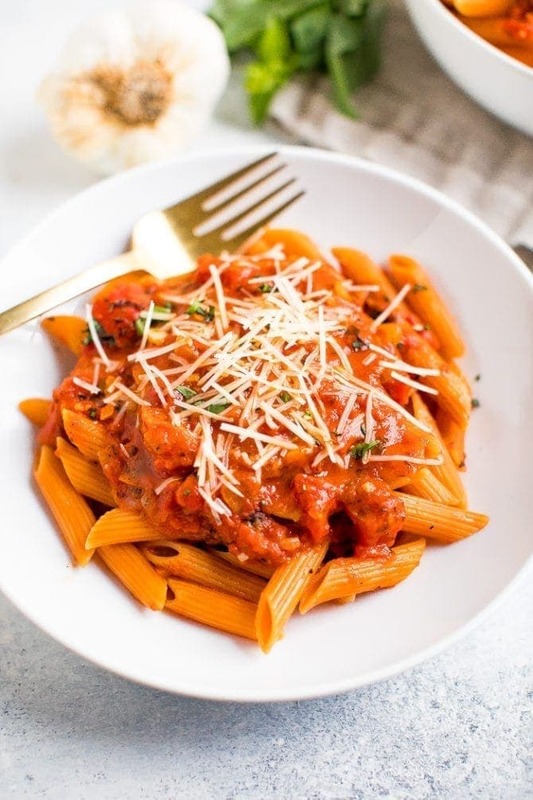 Which brings me to this pasta dish! I feel like Italian food plus a nice glass of wine is the perfect date – either out at a restaurant or at home. 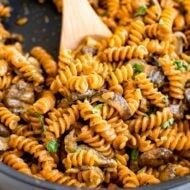 So, when Barilla approached me to create a healthy, vegan pasta dish for Valentine’s Day I was all in. Sounds like our ideal date night! 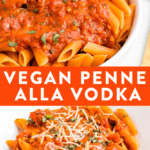 I love creamy vodka sauces, but I wanted to take a stab at a vegan version for you guys! I know a lot of you are plant-based or have dairy sensitivities and might be missing your creamy pasta sauces. The key ingredients in this sauce are: crushed tomatoes, coconut cream and vodka. 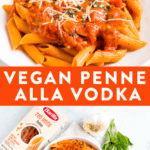 Yes, you actually use vodka in the recipe! It’s used to heighten the flavor, but all of the alcohol cooks off so it’s family friendly. We actually didn’t have vodka on hand when I created this recipe, so I used vermouth instead and it was still delicious! As you probably know by now, I used my beloved Barilla legume pasta to up the nutrition factor of this dish. 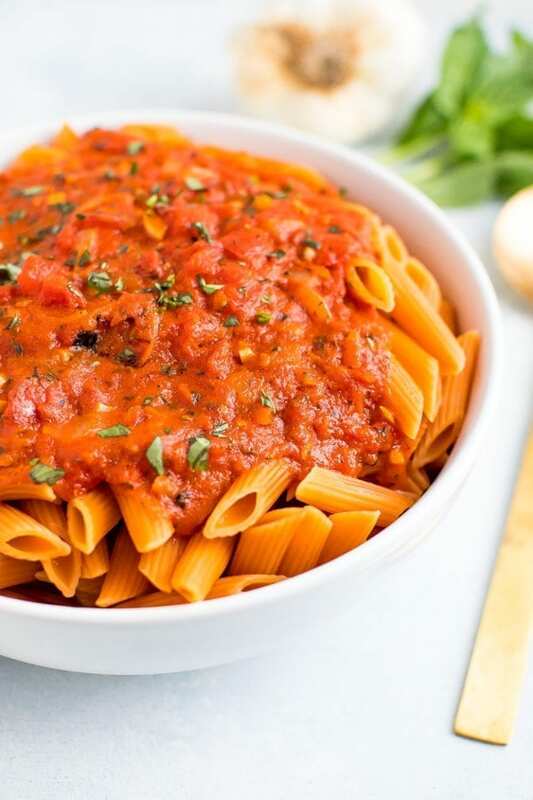 I used the Barilla Red Lentil Penne specifically, which is made with just red lentils… so cool! 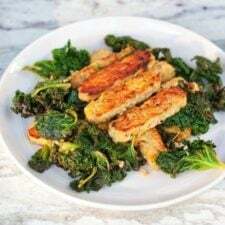 It is packed with plant-based protein and is an excellent source of fiber. 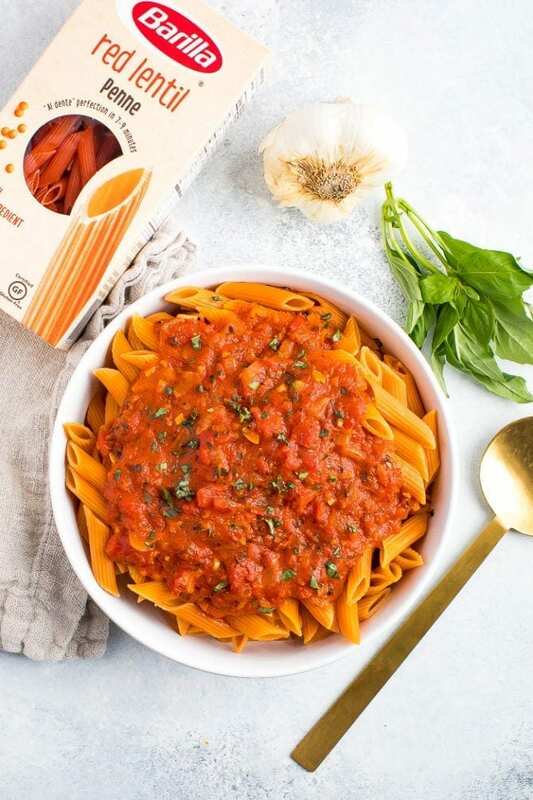 Protein and fiber are usually not words used to describe pasta, so I am obsessed with Barilla’s new line! If you want to check it out, it’s sold on Amazon. For topping the pasta you can use dairy-free shredded parmesan or my hemp parmesan and chopped fresh basil. Don’t forget the basil. . . it’s so aromatic and brings this dish to the next level. 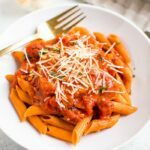 If you make this penne alla vodka please be sure to leave a comment and star rating below. Your feedback is so helpful for the EBF team and for other EBF readers who are thinking about making the recipe. 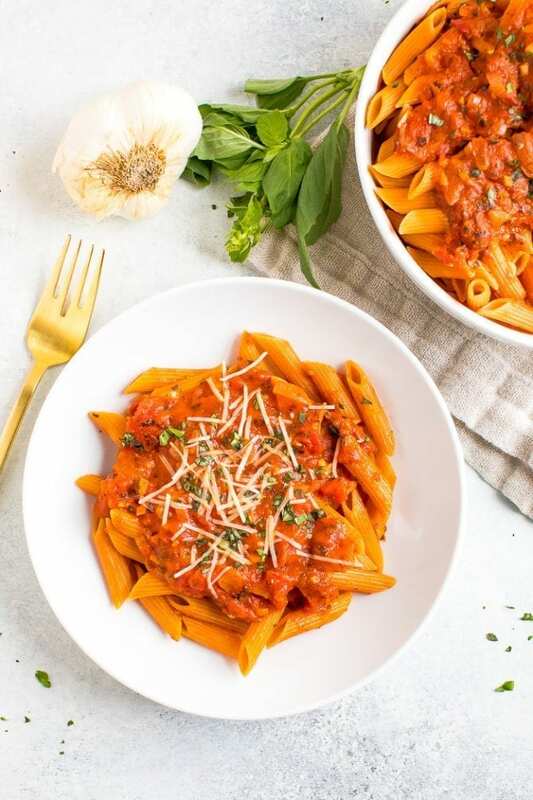 A lightened-up penne alla vodka recipe made with protein-packed red lentil penne and coconut cream. This version has less calories and fat, more protein and fiber and it’s still loaded with creamy flavor. Gluten-free and vegan. Bring a large pot of salted water to a boil, add pasta and cook until done, about 7 to 9 minutes. Drain. Meanwhile, heat olive oil in a large skillet over medium heat. Add garlic and onions and cook for 5-6 minutes or until onions are translucent and fragrant. Carefully add crushed tomatoes into the skillet. Bring to a simmer and add salt, pepper and crushed red pepper. Stir to combine and cook for about 2 minutes before pouring in the vodka and simmering the sauce for another 5-6 minutes. Add in the coconut cream. At this point you can add the drained pasta back to the pot and pour in the sauce to combine. Or you can plate the pasta and add sauce on top. Sprinkle fresh basil and parmesan over the pasta and toss to mix. Serve immediately, passing additional parmesan if you like. How much Vodka is in the recipe? When do you put the coconut cream in?